Wash & soak whole wheat or rawa in plenty of water for 5-6 hrs. Drain & grind with 1 cup of water in a mixi. Squeeze to get the milk. Repeat this procedure 3-4 times more with a fresh cup of water every time & squeeze the milk thoroughly. Allow the liquid to settle, undisturbed for 6-8 hrs. Then pour out the clear liquid as far as possible, retaining only the thick milk. Make a syrup of the sugar with 2 cups of water. Add 2 tbsp milk, boil . When one-string syrup is reached, add the thick milk, stirring well. Add saffron colour mixed in 1 tsp of water to get the required shade of colour. Keep stirring the mixture on a low fire. Keep water boilng ready . When the mixture starts thickening, add 1 cup of boiling water & cook. Add 2 tbsp of ghee. The mixture will again start thickening .Repeat the above procedure in the same order till you have used up all the 6 cups of boiling water. 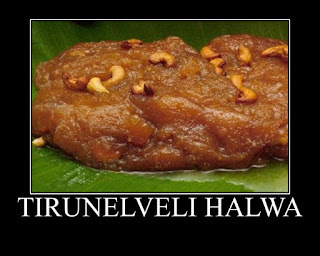 The halwa gets thoroughly cooked to a very soft texture. Now it will become a mass . Add cardamom powder & cashewnuts. Stir continuously so that ghee starts gradually oozing out. Now empty on a greased plate. Serve hot or cool & cut into pieces.